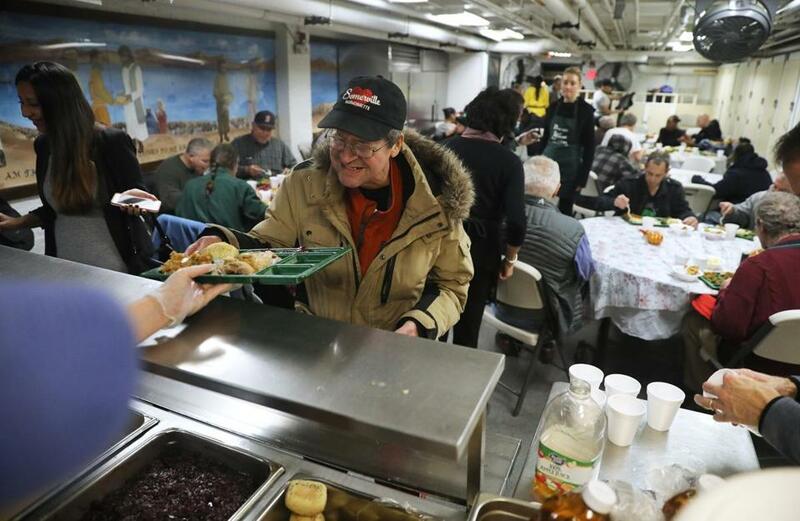 Johnny Mason was served a hot Thanksgiving meal Sunday at the Boston Rescue Mission’s annual Day of Thanks. After 25 years, Burgess Gardner “BG” Hodges III is hanging up his apron, but not before one last Day of Thanks. This year, as he has for decades, Hodges, a 70-year-old teacher from Brewster Academy in Wolfeboro, N.H., arrived at the Boston Rescue Mission Friday with seven eager, young high school students and three alumni ready to work. Students with the school club, called Faith Community, slept on the floor of the shelter, seasoned turkeys, and helped staff prepare for its annual holiday feast called Day of Thanks, always held the Sunday before Thanksgiving. On Sunday, city and state officials including Marylou Sudders, secretary of Health and Human Services, joined volunteers as they served hot Thanksgiving meals to hundreds. They also gave out 198 baskets that each contained a turkey with all the trimmings for families to take home. Lynn Alexis, 17, of Malden was excited to be spending quality time with her mother, Ginette Alexis, 47, who recently arrived from Haiti. This will be her mom’s first Thanksgiving. Food service manager Dennis Gaskell said he treats anyone who walks through their doors like a guest. That’s how he felt when he arrived at the mission homeless and seeking help decades ago. What he found, he said, was love.